A gemstone prised of its intense colour. A fine sky blue turquoise comes from Iran, a greener colour comes from Tibet. Other material comes from Mexico, USA, the former USSR, Chile, Australia, Turkestan and Cornwall, England. Some material is very porous ind is impregnated with wax or resin to stabelise it and to improve its appearance. It is often imitated by stained howlite. In history turquoise has been thought to warn the wearer of danger or illness by changing colour. Turquoise is a Light blue / blue-green general healer for all illnesses. It is an excellent conductor (high copper). Gentle and cool, it is soothing, tones and strengthens entire body. It strengthens and aligns all meridians and energy fields, it protects and detoxes from alcohol, poison, pollution, x-ray / sun radiation. As an ancient absorber of "negativity" it offers protection from the "evil eye". 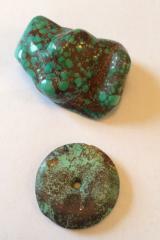 Turquoise helps with tissue regeneration, aids circulation, lungs, respiratory system, vitalises blood, nervous system. It helps fight against anorexia, headache,asthma and infections. Enhances creative expression, peace of mind, emotional balance, communication, friendship, loyalty , balances yin / yang. Fades in sunlight, or when in contact with sweat or oil. Avoid using on the beach or in swimming pools. Turquoise is the Modern Birthstone of the star sign Capricorn . The famous mineralogist George Frederick Kunz in his 20th century book 'The Curious Lore of Precious Stones' associated Turquoise with the planets Mercury and Venus. Turquoise: mainly Vishuddha, the Throat Chakra ( 5 ).